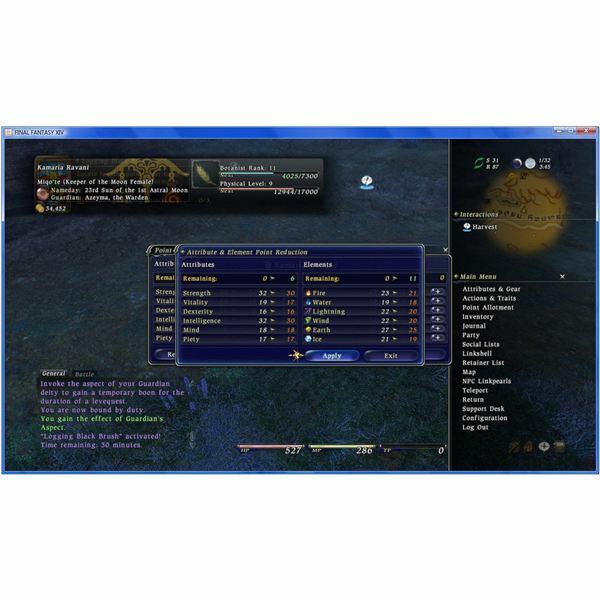 While much in FFXIV depends on one’s class level, stat points are awarded through advancement of physical level. Once a new physical level is attained, a message will show up in the chat box, noting how many attribute points have been awarded. The point awards increase with physical level (for example, at level five only four attribute points are awarded; at level fourteen, eight are awarded) and the same number of points are awarded for both regular and elemental attributes. When AP have been awarded, simply go to the main menu and choose "point allotment." This will bring up a dialog box that shows the amount of free AP and allows the points to be distributed one at a time to any stat. There is also a button in the point allotment menu labeled "reassignment." Reassignment only allows a small portion of the stats to be reassigned, and this ability has a cooldown. This is only really useful for undoing mistakes. As of right now, there is no way to completely reassign all attribute points, so think before spending! For lack of a better name, I’ll call the FFXIV stats that make up the regular fantasy game just that – regular. These stats are strength, dexterity, vitality, piety, mind, and intelligence. Three of the FFXIV stats primarily affect magic, the other three primarily affect physical combat. These FFXIV stats are not purely combat-based, however. Stats also affect gathering and crafting. For example FFXIV piety helps fisherman (that pious lot) gather, and helps out alchemists and culinarians – when they’re using their secondary tool. Below is a basic list of what each stat does and how it effects the non-combat disciples. Please note that while a given stat will obviously help some Disciples more than others, there may not be as much benefit to completely ignoring the other stats. For example, Vitality helps everyone out, by providing more HP. Dexterity may be somewhat useful for Disciples of Magic, since a few of their attacks are based off of physical weapon accuracy. Elemental FFXIV stats are not that well understood. It’s known for certain that having a high score in one elemental stat will reduce damage taken from opposing elements. It’s also fairly well proven that having a high fire score will increase the chances of picking up fire crystals while gathering. However, it’s also been theorized that the elemental attribute increases spells and abilities (such as offensive spells) that relate to that element. Also, that it may improve the success rate of synthesis using those crystals. Neither of these have been conclusively proven yet.